Community Development Department holds the event of 10 OTOP happiness to promote the country’s economy. Mr. Sutee Markboon (middle), Deputy Minister of Interior, presided over the 13th OTOP City 2018 held under the concept of “OTOP City Happy Market 2018” having Mr. Nisit Chansomwong (the 2nd from the right), Director General of Community Development Department, and many distinguished guests to attend the opening ceremony. Community Development Department holds the event of 10 OTOP happiness to celebrate the New Year provided with more than 20,000 items of gifts to promote the country’s economy and deduct the taxes. The cooperation has been made with TAT in arranging the tour packages to travel to the OTOP villages with the attempt to attract people to the community. This can generate the income and stimulate the economy from the foundation. For this year, it is aimed to have not less than 3,000 entrepreneurs to attend the event together with not less than 400,000 visitors. This can generate the income for not less than 900 million baht and can distribute the income to the foundation economy to be strengthened. 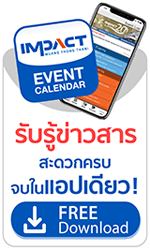 The event OTOP City 2018 is held from December 15-23, 2018, at Challenger 1-3, IMPACT Muang Thong Thani.